Recently I wrote a post about new information on the anti-union financial disclosure bill being debated in Canada’s Parliament. This new information was collected by two University of Regina researchers, and was mostly collected from publicly available documents. I also recently watched this segment of the Last Week Tonight with John Oliver TV show – a segment that brilliantly dismantles the Miss America Pageant’s claim to be “the world’s largest provider of scholarships to women in the world” [sic]. The information for this segment was also collected from publicly available documents. Now admittedly the Miss America Pageant’s misrepresenting its scholarship awards doesn’t have the same potential large-scale societal impact as federal legislation, but the reporting of both sets of information has something in common. They’re both good investigative journalism – and neither was done by journalists. (One commentator calls Oliver’s work “investigative comedy”.) So why are comedians and university professors doing the kind of investigative work that media organizations should be doing, but generally aren’t? From my own experience, I can suggest a couple of reasons why investigative journalism is not a priority for many media organizations. Journalists are short on time. 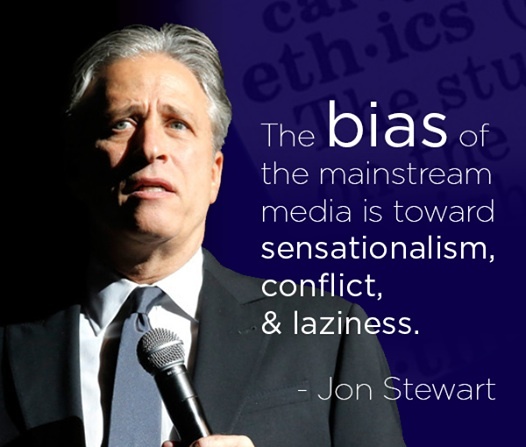 Many media organizations are understaffed, and the journalists at those organizations are working very hard in less than optimal conditions to generate any news coverage at all. Media organizations are focusing on shorter, easier to comprehend stories. Investigative journalism usually produces lengthy stories with detailed discussions. Editors or producers – especially those who believe that their audience has a limited attention span – may push for less complex stories that can be communicated more quickly. The organizations put their resources toward stories that are easy to report. This ties into the “lack of time” issue. A press conference, a photo opportunity, or a press release all provide ready-to-use information that can quickly be made into a story or news item. An investigative analysis usually requires time and effort to find, compile, analyze, and write up a lot of information. Investigative journalism often produces controversial results – and, sadly, many media organizations are reluctant to offend influential readers or advertisers. This excellent new book about the New Brunswick newspapers owned by the powerful Irving family makes the point that such reluctance doesn’t have to be explicit, as in the subject of an investigation telling a producer or an editor not to pursue a story. Instead, journalists and their supervisors know from what’s published or broadcast, and what isn’t, the types of stories are supported and valued. And, when media organizations like Postmedia are attending industry conferences to give presentations on how they want to “partner” with advertisers on editorial content, journalists understandably might be reluctant to even suggest critical or analytical stories. Ironically, though, many media outlets in Canada are losing readers and viewers. This may be partly because Canadians are getting more of their information from the Internet than from traditional media sources. But readers or viewers may also be going elsewhere because they are not finding value in traditional media sources’ news coverage. If the information from this sources is mostly short, easy-to-follow stories whose content is available in many other places, readers and viewers have no reason to regularly use a traditional media source – and in looking elsewhere, they may also be seeking information that’s more substantive and enlightening. Investigative journalism is one way to provide informative content that would “add value” to media organizations’ product, and help to attract and retain readers or viewers. And when I say “investigative journalism”, I’m not only talking about the multi-part stories that require significant time and resources – like the type of investigative stories that win Pulitzer Prizes. I’m also talking about generally looking a little more critically at information, and doing some quick research to see if there’s something else going on. I’ll give an example of the sort of investigative journalism that, in my opinion, many media organizations could be doing with relatively little additional effort. 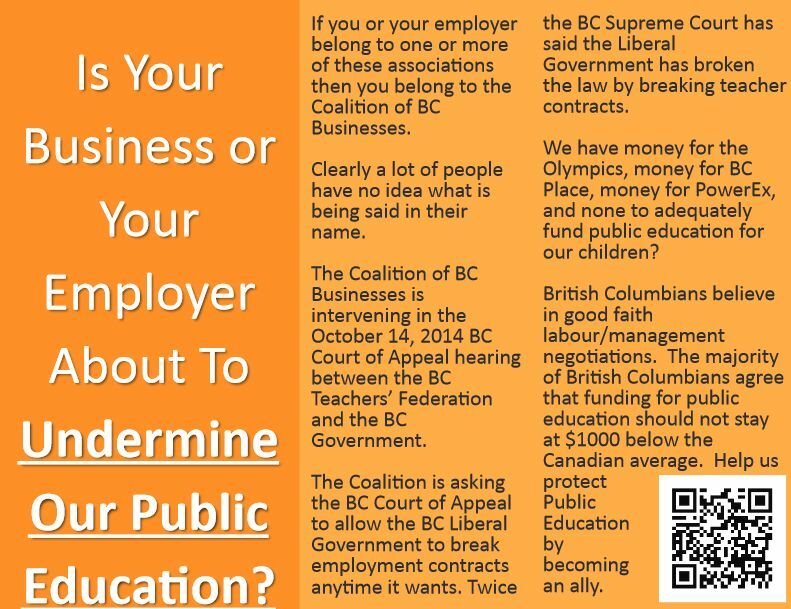 I’ve written a couple of posts about the Coalition of BC Businesses and its application for intervenor status in the BC government’s appeal of a Supreme Court ruling in favour of the BC Teachers’ Federation. This is an important news story for several reasons. It relates to the lengthy and bitter BC teachers’ strike this past summer. The court decision that is being appealed has major implications for future collective agreements between BC’s teachers and the BC government, in addition to containing some very strong criticisms of the government’s past bargaining practices. And the Coalition apparently had no involvement with or relationship to either the bargaining dispute or the court case before it announced its application to intervene. So here is a quick overview of how this story has been covered by the Vancouver-area media. The Coalition issued a press release in early July announcing its application for intervention. Several newspapers and radio stations repeated the contents of the press release, including the Coalition’s claim that it represented “500,000 employees and 50,000 employers”. Within days of the press release, one of the Coalition’s member organizations – the Western Convenience Stores Association – asked the Coalition to withdraw its application, because “it was our understanding in approving the Coalition’s request to apply to intervene in the case that the application would not represent a position on the dispute”. Links to this statement were widely circulated on Facebook and Twitter, but no local media organizations that I’m aware of reported this information. Within a few weeks of the application for intervention, the Coalition removed its membership list from its website, and then removed information from its home page about the number of employees it claimed to represent. There were numerous posts on Twitter and Facebook by individuals who had used the information on the Coalition website to contact businesses and express their disagreement with the application for intervention. No local media organizations that I’m aware of reported on the Coalition removing the website information, or on the backlash against the Coalition’s application. In September, the Coalition’s application for intervenor status was approved by the Court of Appeal. Some local media outlets reported on the approval, but as far as I’m aware none mentioned the events that occurred between the application and the approval. In mid-September, the Coalition posted a press release on its website responding to the criticisms of its application. No local media organizations that I’m aware of reported on this. And most recently, a group called Allies for BC Public Education has started a formal campaign against the intervention. This group’s activities have received minimal media coverage despite the campaign being quite visible on Twitter, Facebook, and YouTube. Here are some more questions about the Coalition that could, and should, be asked by the media. Is the Coalition involved in activities other than those reported on its website, and if so, what are they? Who makes the decisions as to what activities the Coalition becomes involved in? Since the Coalition doesn’t appear to have any full-time staff, who performs the Coalition’s work? How are the Coalition’s activities funded? What is the Coalition’s annual budget, and what are its major annual expenditures? Why did the Coalition remove the information about its member associations from its website? What was the process that the Coalition went through in deciding to make the application for intervenor status? What input did member organizations and/or member associations have in that process? In 2010, the Coalition listed 17 associations as members; the list it removed from its website in September (as recorded here) named 11 members. Why have six member associations left the Coalition? Are there legal implications if an organization is approved as an intervenor in a court case on the basis that it represents certain stakeholders, but some of those stakeholders then express opposition to the application? These questions are all based on information that I found or didn’t find online, through a Google search using “Coalition of BC Businesses” as the search term. In other words, generating these questions didn’t require a huge investment of time or effort. To be clear, I am not posing these questions as a criticism of the work of the individual reporters or journalists who have covered various parts of the Coalition story. I understand the conditions and pressures under which they work, and the demands of the workloads that they have to manage. However, I would like to think that a media organization receiving a press release from an organization claiming to represent a specific number of companies and employees would check the accuracy of those numbers. Anyone looking at the Coalition of BC Businesses’ website at the time of the July press release would have noticed that – other than the names of member associations – there wasn’t a lot of information to support the membership numbers that the Coalition was claiming. That alone should have triggered much more critical attention to the Coalition and its activities. Comedians and university professors might be capable of doing good investigative journalism, and the examples I cited above show that they are. But we shouldn’t have to rely on non-journalists to do the investigations that the media are supposed to be doing. And all that work needs to get started is a critical and curious perspective. John Oliver wondered: is Miss America really the largest granter in the world of scholarships to women? The university professors wondered: where did this statistic about public opinion come from? Media organizations have the greatest amount of expertise and knowledge to be able to find answers to these kinds of questions. And if these organizations have limited resources, instead of regurgitating the same information as every other media outlet, it might be more productive to direct at least some of those resources toward more investigative reporting. A lot of readers and viewers would likely be very glad to see that happen. The relationship of the CBBC to the BCLiberal Party also deserves investigation as the whole story has the air of smoke and mirrors. I found the Appeal Court’s decision to grant intervener status to be quite sobering and took it as a wake up call for many regarding the risks involved in going to court. It should have cured the slam dunk view that many erroneously held regarding the nature of the process.